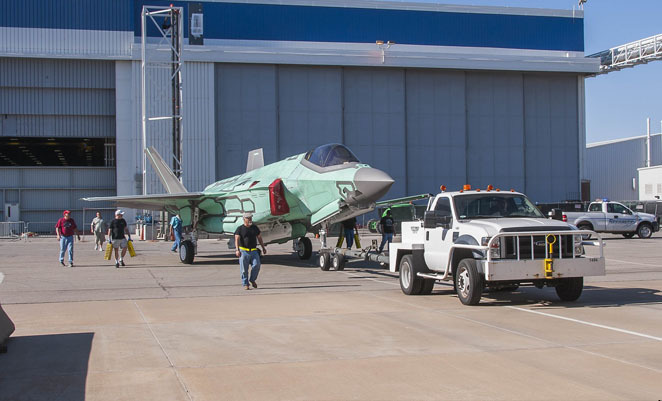 Images of the RAAF’s first Lockheed Martin F-35A Lightning II being towed from the production line to the paint facility have been revealed. The aircraft, dubbed AU-1 and appearing in primer colours, is due to be officially rolled out in July and delivered to the USAF’s Integrated Training Center at Luke AFB in Arizona later this year. Inspite of the arm chair critics, I believe that this will be a winner for us. Remember we started in the Pacific War with Wirraways in the fighter role! 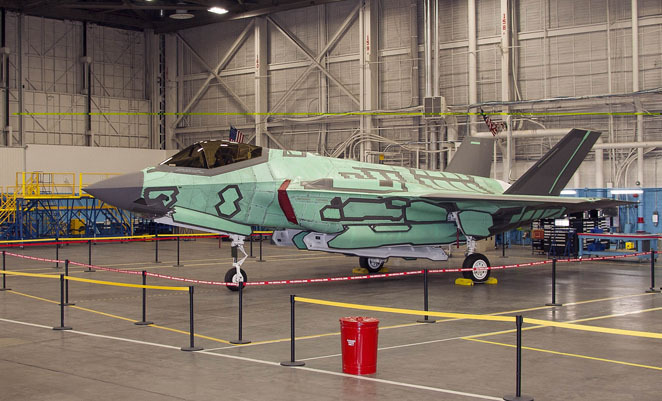 At least this is a current production fighter..
Am I the only one who feels that all the blarney/obfuscation about the jsf hides the fact that it is akin to the ’emporer’s new clothes”,story: a lot of adulation,admiration and mumbo-jumbo, but little or no substance. Are we all being hoodwinked? Hi Ken …hope your not reading Air Power Australia? The F-111 had a number of teething issues when first introduced into the US Air Force, and Australia nearly cancelled the deal for them.40 Years latter it was known as a excellent choice for Australia. 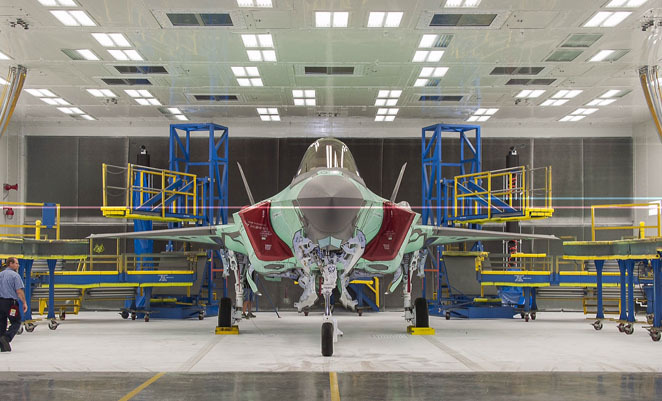 All new Cutting edge air craft have teething issues when first introduced.JSF has flow some 17,000 hours and 100 plus air craft have been produced. Issues are being fixed and the plane is meeting its requirements.Not to many planes will come onto the market being able to fire most weapons available to the western world.Also JSF is an intelligence and surveillance and reconnaissance aircraft as well as a fighter bomber.It dose a number of roles extremely well and will save Australia money in the long run.JSF is the right air craft for Australia as we operate a number of US platforms. Think of it as Buying an IBM computer ,we would not then go on to buy apple products and have issues with our pc not being able to communicate with our apple products. Think of economies of scale, as our air power partners begin to fly this aircraft the total knowledge available in relation to aircraft capabilities, servicing/maintenance requirements will grow. Australia is buying the conventional take off variant of the aircraft, from what I have read the issues to date have been with the more complicated VSTOL variant. The F35 is a good and future proofed flight platform that will serve Australia well into the middle of this Century. The aircraft will also provide a huge technical edge over our neighbours. Top ten reasons not to buy the F-35 — here. Just to clarify, Pierre Sprey didn’t “design” anything, whether it be the F-16, F-15 (as your link states) or the A-10. He was part of Col Boyd’s ‘fighter mafia’ that helped to define the requirements for the F-16 and A-10. As with all new tech, the more complicated the system, the more complicated the problem. Remember when fixing the family car involved a mallet and screwdriver? The F35 will continue to have problems and develop new ones as components were out faster than expected, but this always happens. Think of the problems that faced the A 30 and B787 and the new issues that occasionally pop up for these aircraft. I’m sure in days gone by people doubted the Spitfire, P51, F4 (Corsair and Phantom) and the F15. Yet they have all proven themselves, given the chance.